I used to avoid recipes that called for separating eggs whenever possible. First of all, the whole process just seemed to fussy to me. Secondly, if the recipe only used one part of the egg, I always wondered what I would do with the remaining egg. Throwing it away just wasn’t an option. Fortunately, I’ve learned a thing or two since then. I’ve realized that separating eggs takes just seconds more than cracking an egg. And I’ve learned what to do with any remaining egg parts. All it took was a willingness to get my hands dirty and to be a little (very little) creative. There are many ways you can separate an egg. There’s the old stand-by of shell half to shell half, moving the egg yolk back and forth until all of the white is separated from the yolk. This is my least favorite method. It’s definitely the fussiest method and it’s easy to mess up. If you accidentally poke the yolk with egg shell, it will start leaking and you’ll end up with yolk in your whites, or vice versa. You can also crack the egg into a slotted spoon and let the egg whites strain through into a separate container so that all you are left with is the yolk. This method works like a charm and is very easy. However, it dirties an extra utensil and sometimes there are already more dirty dishes in my kitchen than I can stand. So my top egg separating method of choice is using my hands. I crack the eggs right into my cupped palm and let the egg whites strain through my fingers just like with the slotted spoon. Then I just wash my hands and move on. It doesn’t get much easier than that! If you’re squeamish about touching raw eggs though, the slotted spoon method is definitely the way to go. Now that the eggs are separated, what do you do with the remaining yolks or whites? Here are some ideas to help you out. I like to use egg whites mixed with a little water for coating meat that is going to dredged in flour or breadcrumbs. It works the same as coating with a whole egg. Either extra yolks or whites can be stirred into other eggs when making an egg dish, from a simple pan of scrambled eggs to a more elaborate quiche. If you have an abundance of egg whites, make some meringue cookies. Definitely my favorite use for leftover egg remainders! When I have just two egg yolks left over, I’ll sometimes use them to make up a pan of Rich and Creamy Macaroni and Cheese. Sometimes the simplest option is best – store the left overs for use at a later date! Both egg whites and egg yolks can be frozen. Transfer the egg whites to a freezer-friendly container or baggie and freeze. Two tablespoons of thawed egg whites equal the egg white from one egg. Yolks are a little trickier to freeze and re-use, but it can be done. For four egg yolks, whisk with either 1/8 teaspoon of salt or 1 1/2 teaspoons of sugar. Then freeze as stated above. The egg yolk/salt combination can be used in savory dishes and the egg yolk/sugar combination can be used for baked goods. 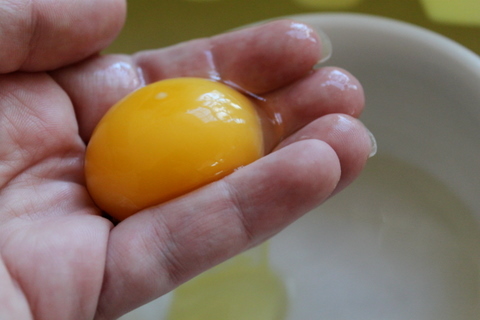 One tablespoon of thawed egg yolk combination is equal to one fresh egg yolk. Both the frozen whites and yolks can be frozen for up to 4 months. What is your preferred egg separation method? What do you do with the remainders? I’m sure there are lots of ideas I’m forgetting! i separate the egg with the shell. i like to make lemon curd with the yokes.